Firefighters rescued a woman from a kitchen fire burning in a west Las Vegas condominium early Saturday morning. Firefighters rescued a woman from a kitchen fire burning in a west valley condominium early Saturday morning. 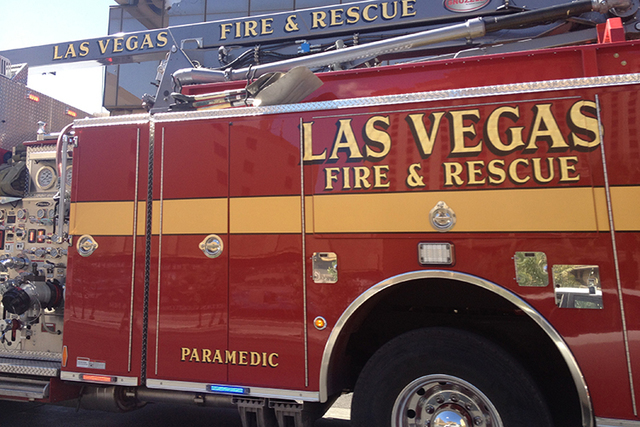 Just before 2 a.m., firefighters received reports of smoke coming from a condominium in the 2200 block of South Fort Apache Road, near Sahara Avenue, the Las Vegas Fire Department said in a news release. Arriving responders saw smoke coming from a second-floor condo unit and forced entry to find the fire burning in the kitchen, the release said. As firefighters fought the fire, responders searching the condo found a woman in a bed, the release said. The woman, covered in soot and coughing, was taken by ambulance to a valley hospital for minor smoke inhalation. “Her injuries did not appear to be life threatening,” according to the release, which also noted the woman appeared to be impaired. According to the fire department, the fire started on the stove and had spread to cabinets above the stove; investigators found one of the stove’s burners had been in the on position, the release said. “The occupant told fire investigators she did not remember much about the previous night and was not sure if she was cooking,” the release said. Fire investigators said the condo unit had fire detectors but the alarms were apparently unheard by the woman. The fire was ruled accidental, and the estimated cost of damage was $15,000, the release said. Fire damage was confined to the kitchen, but the rest of the unit had smoke damage. Firefighters from the Clark County Fire Department assisted, the release said. “Occasionally victims are found by firefighters with operating smoke alarms unable to escape because they are impaired by alcohol, medication or drugs,” the release said. The fire department said fast response times were vital in such cases.